Well I think the title maybe a little inaccurate and that is may take more than one year, but I set out to create a quilt using my Crazy quilt blocks in 2018. When you view them you will see that there are various sizes, themes and colour schemes. Is it possible to take them all and combine them? Take these 8″ x 8″ blocks. Putting some together may work but in my opinion there are two many colours involved, so the first challenge was selecting a colour scheme which would work for them all. 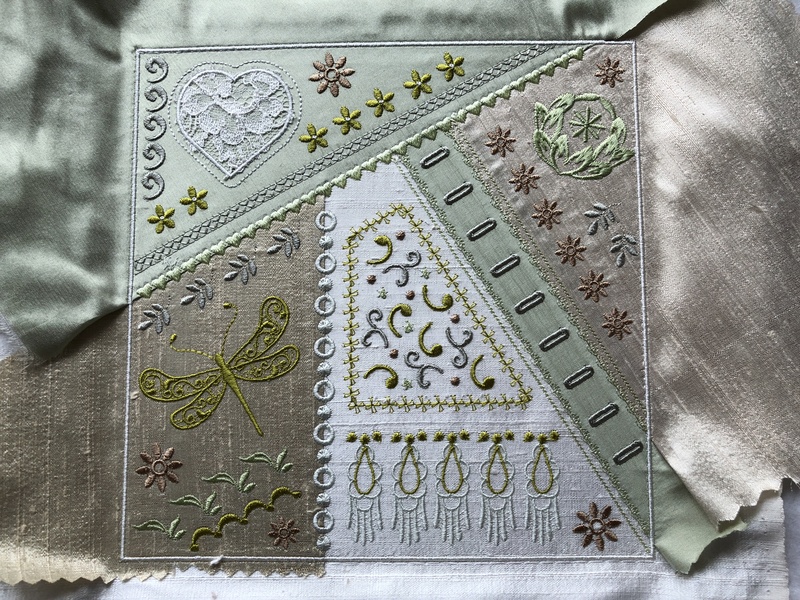 July 6th: Today I planned and stitched my first crazy quilt block for this challenge. 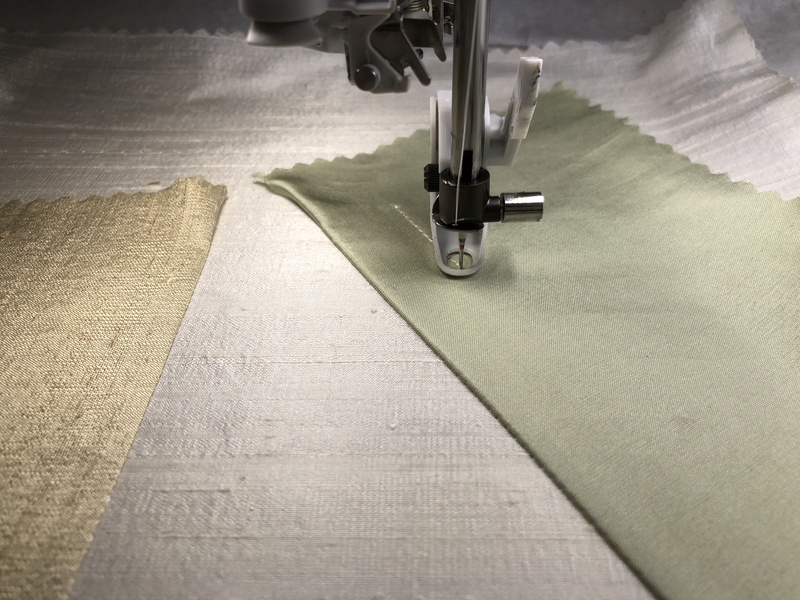 I decided that it would be best to use ivory dupion silk as the base fabric for each 11″ square. 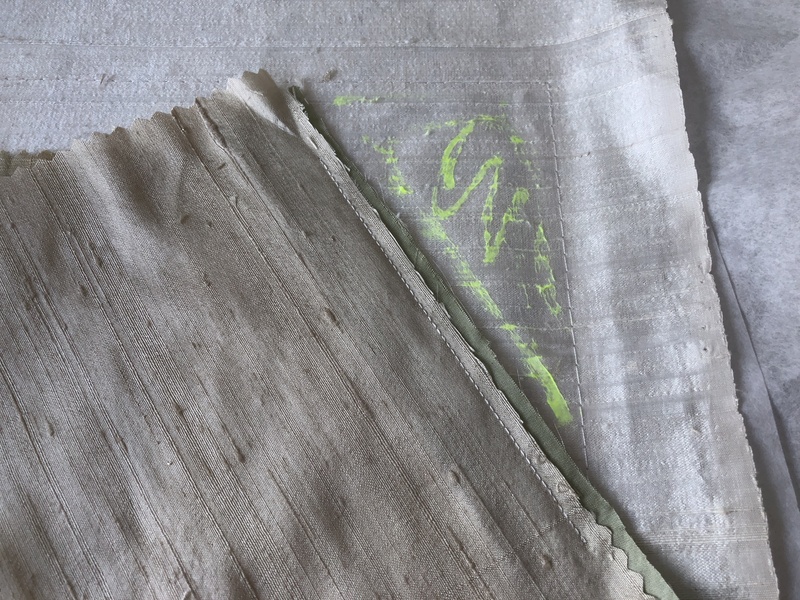 With my assortment of pale greens, ecrus and cream silks I began to attach the various blocks. 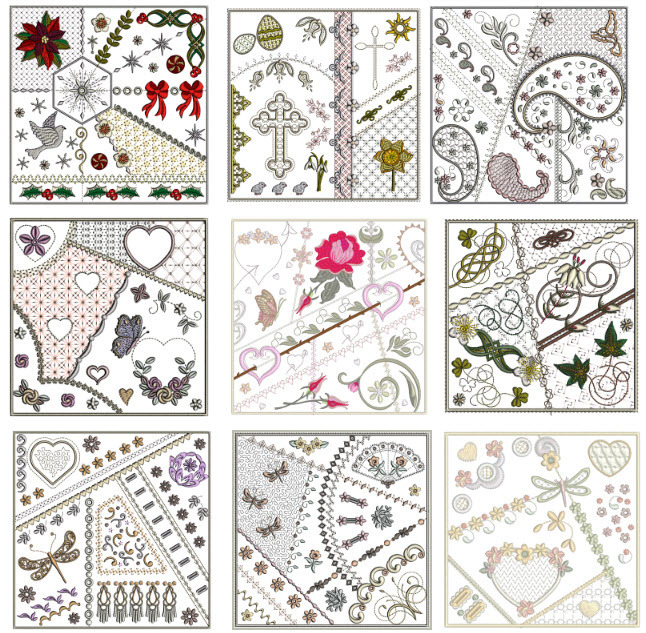 I selected to do this with my first Romantic Crazy quilt block using the larger 8″ x 8″ design. (GFE-RCQ-1 8×8) I have to confess I love using my 200mm x 200mm square hoop; it has to be my favourite hoop. After I had attached four fabric pieces I noticed my first error. 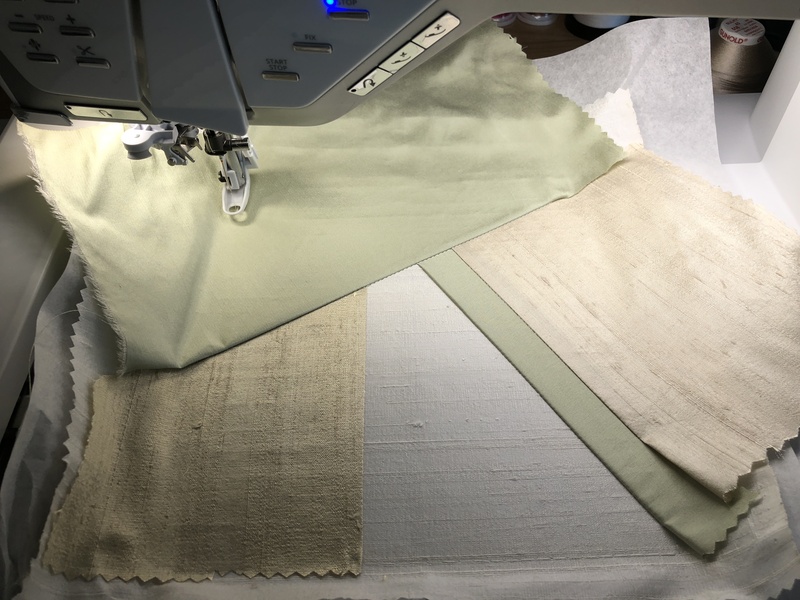 I had used the same fabric for two sections and failed to use my gorgeous pale apple slubby silk dupion!!! That will have to wait for the next block. When I add pieces to my quilt blocks I use a glue pen to hold the fabric in place when it is folded over. This was where I made my first mistake, using a smooth silk I had already used instead of a slubby one. 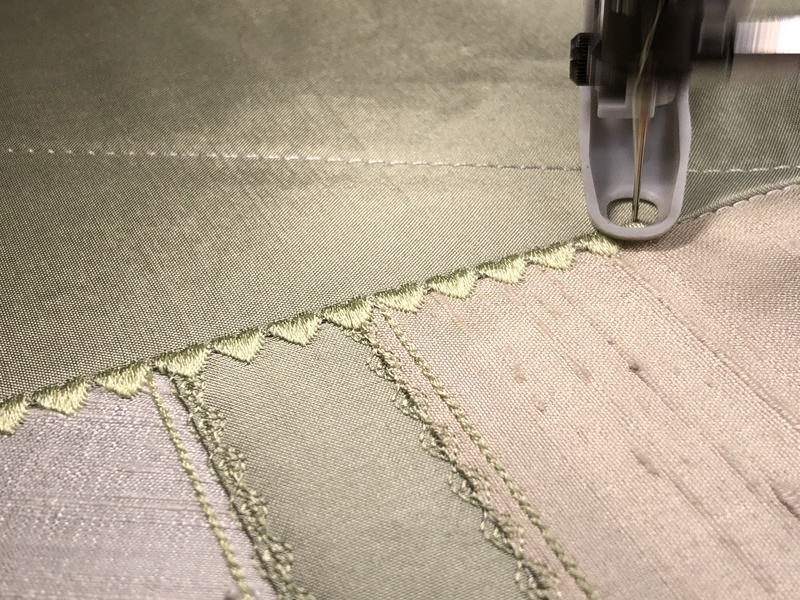 Here you see the outline of basting stitches which hold all the pieces in place before the embroidery begins. 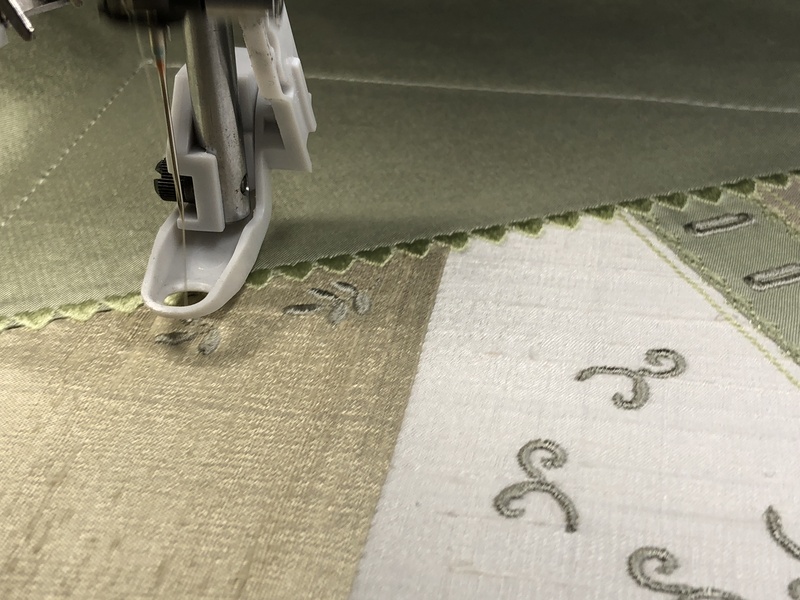 With careful digitising many of the embroidery covers the joins. Notice that I have selected a shade of thread that matches the fabric. The PDFs which come with these designs are full of diagrams taking you through each step of the construction. 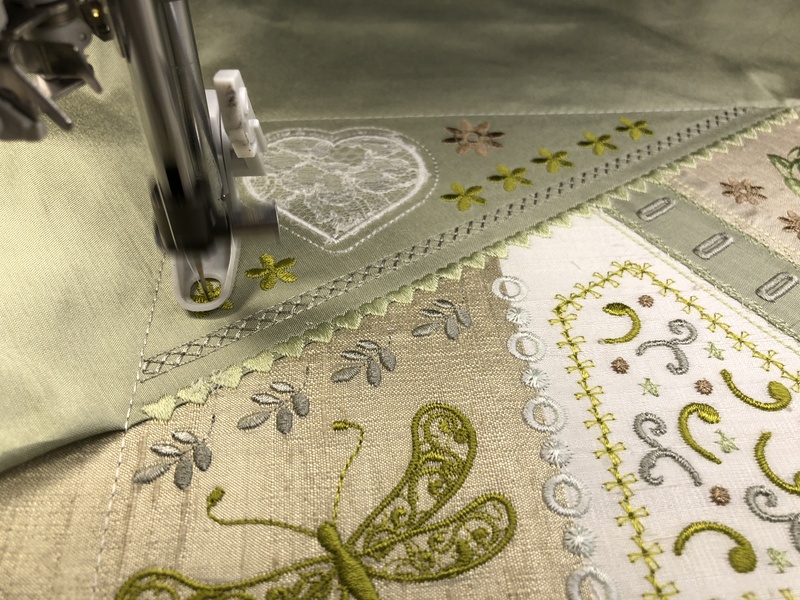 These button holes can be left alone or cut so that ribbon can be threaded through. 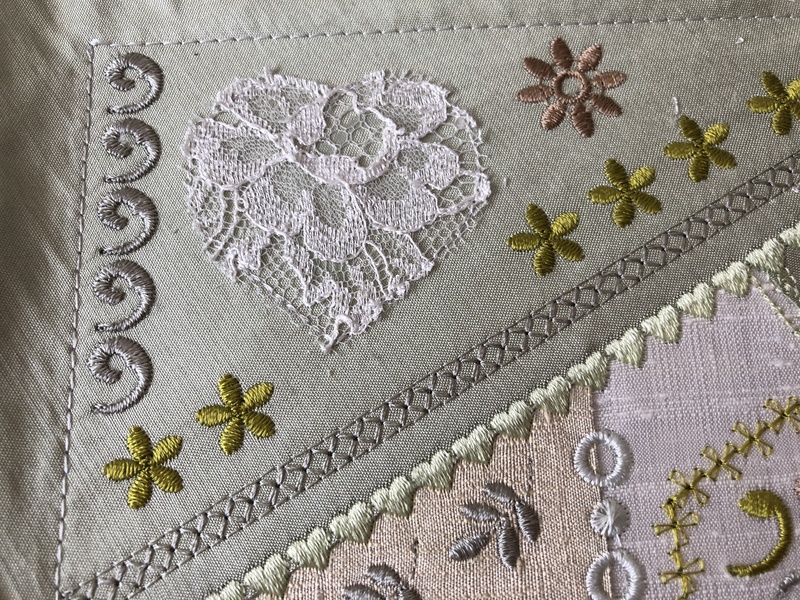 If you have some favourite lace scraps they can easily be incorporated into crazy quilting. 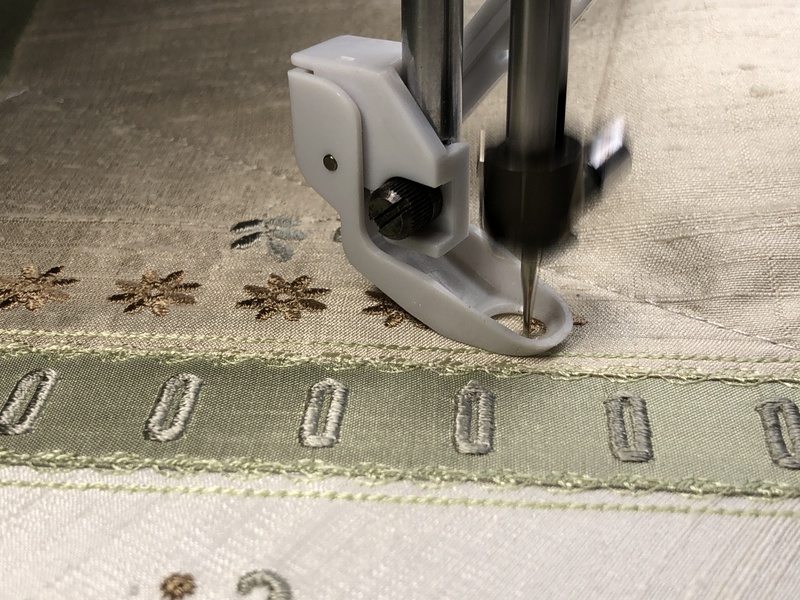 Without a great deal of preparation it can be hit and miss whether the colours embroidered in each section stand out. 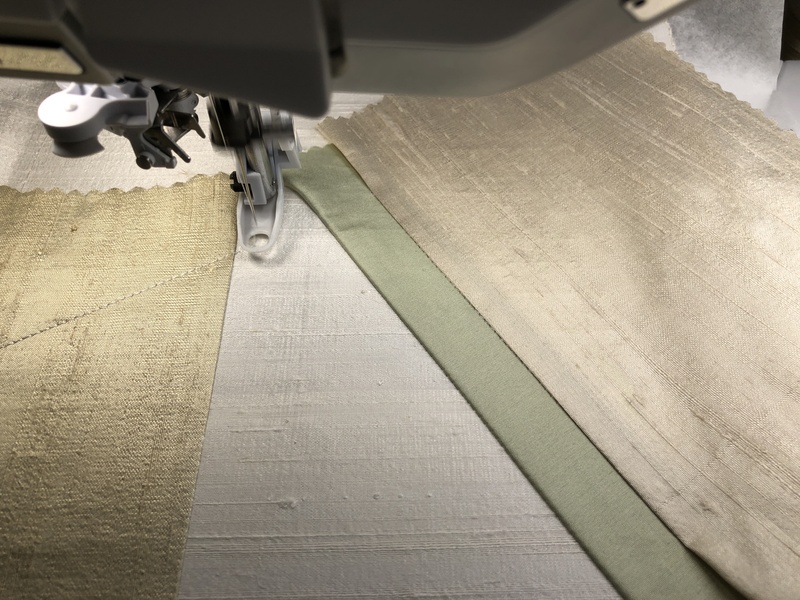 They can be lost if the fabric is not significantly different. Getting a happy balance of bright, subtle and matching threads is the secret of a perfect colour palette. The balance of colour both for the thread and the fabrics, is almost perfect, so I will move on to preparation of the second block. I think that any decoration should wait until all the blocks are complete so that I can check I have sufficient embellishments for them all. Next time I will show you some of my other blocks that have been adapted to fit this colour scheme. 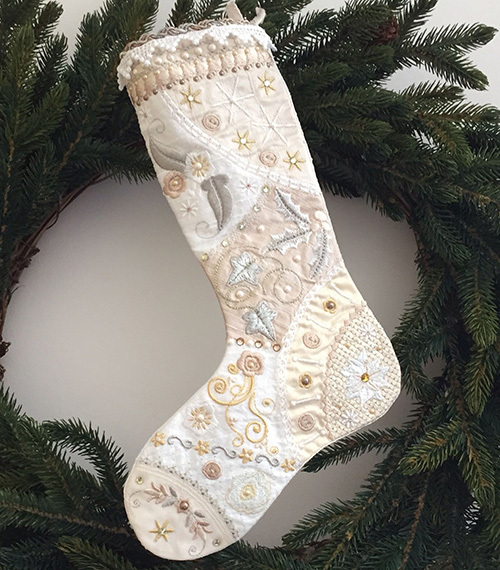 At present there are 14 crazy quilt blocks for sale and 2 crazy quilted stockings. 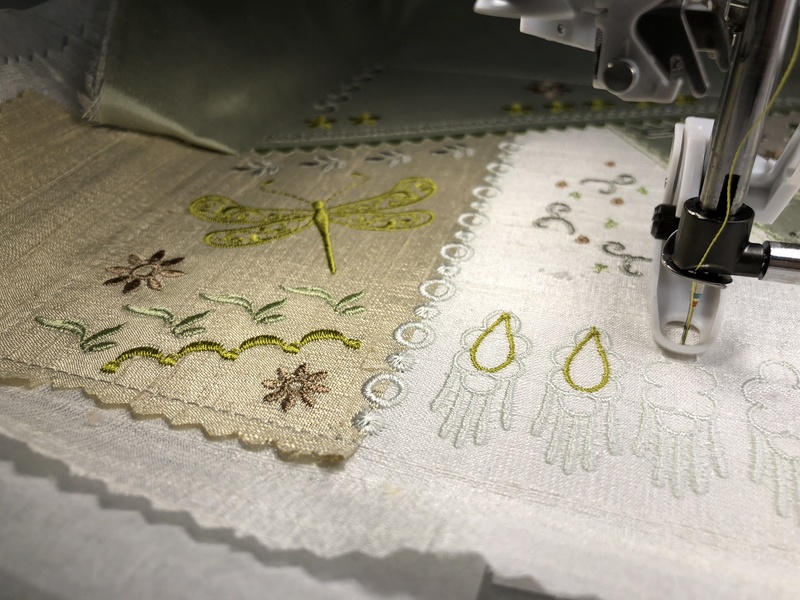 This entry was posted in Discussing machine embroidery and tagged applique, Crazy quilting, development of embroidery, embroidery on silk, machine embroidery, quilt blocks, The importance of colour. Bookmark the permalink. Hi Hazel perhaps this would have been a good competition so we could see everyones quilt that uses the same blocks and colour ways be it in silk or cotton. Hazel that is a gorgeous colour scheme (green is one of my favourite colours) and as much as I would love doing something similar with your lovely blocks I know I will never find the time – too many other things on the go. I am very anxious to see your quilt completed. I do love your color choices. I hope to do one in soft greens and shades of lavender . I however don’t know where to find silk fabric. 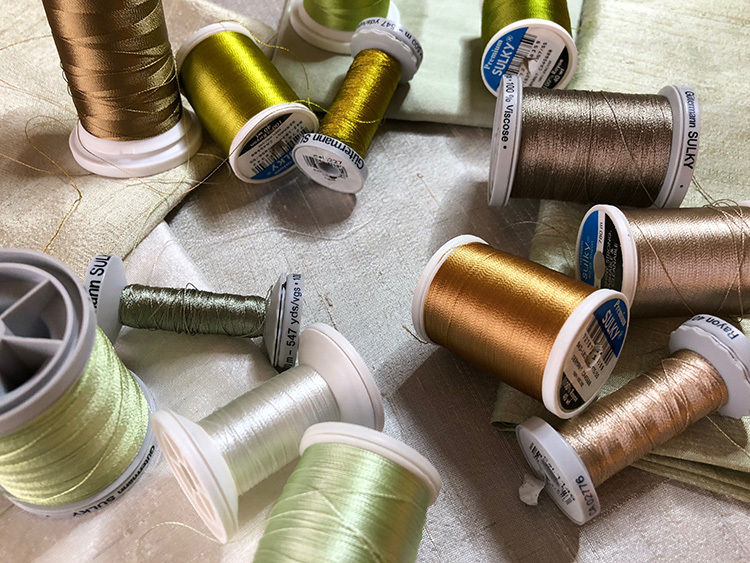 Is there a website that you prefer to use for purchasing your silks? 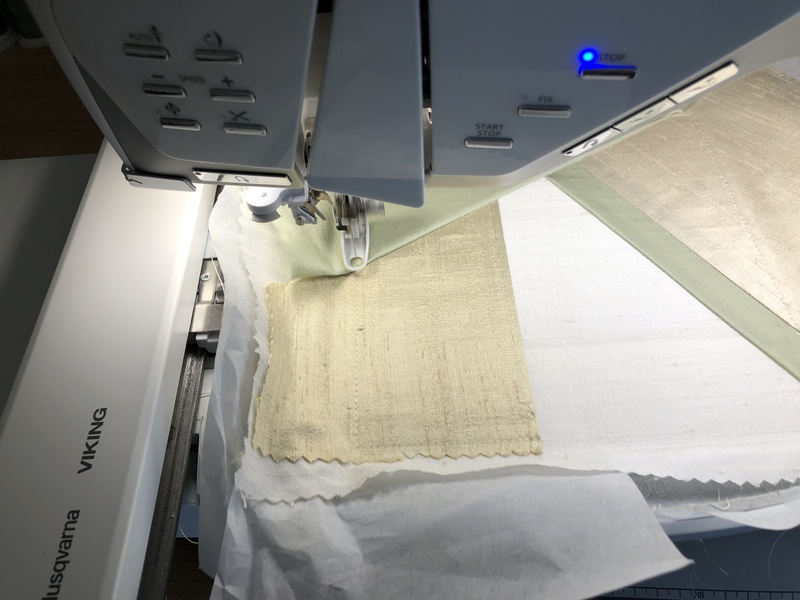 Unfortunately I have been in the process of unpacking for a while from our move, otherwise I would have tried to find silk fabric prior to now and I would have entered the computing. I really don’t want to use cotton, I think the blocks will lose their elegance.